For a hosting company nothing is more important than a professional looking website that will present your business to the world. If a website does not have a modern, pristine, and clean design it will be harder for that business to top their competition. To help you step up your game we have selected here the 20 best hosting WordPress themes. Your necessary features list should not be too long. You need to look for a responsive design, WHMCS integration, domain checker, demo content importer, and an integrated page builder. If a theme ticks off these features than you are all set and ready to go. To save you time from searching for these specifications we present the 20 best hosting WordPress themes on the market! Hostcluster is a responsive hosting WordPress theme designed specifically for this purpose. This theme’s design is mostly clean and simple but it also contains some bold elements to catch your visitors’ attention making it both traditional and modern at the same time. 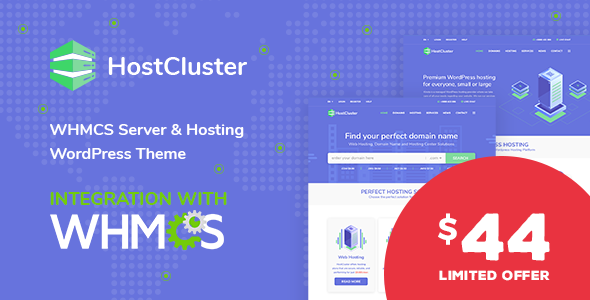 Hostcluster inludes various demos, GDPR compliance, many pre-designed sections, Visual composer, Slider revolution, and WHMCS integration, blog settings, social media integration, video and parallax backgrounds, and custom widgets. If you are providing hosting services you will want a website that generates traffic and sells. Because of this you have to choose a theme that showcases your services and advantages and Valence certainly does this. Valence comes with lots of helpful features such as 2 homepage versions, mobile optimization, Visual Composer, Ajax contact form, many icons, parallax effects, cross-browser compatibility, and a WHMCS template included. You can choose any type of layout you want thanks to its integrated Visual Composer which has only responsive elements. Valence is a quality theme and it should make your list! 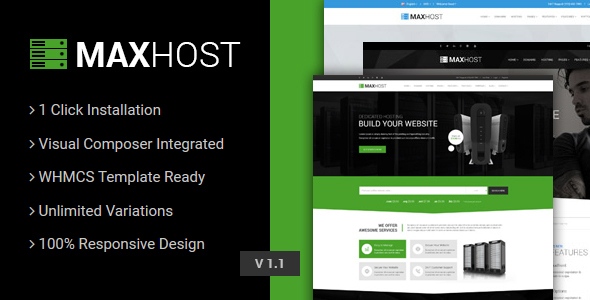 Maxhost is a highly popular, stunning, artistic, and professional hosting WordPress theme. According to its developers, Maxhost is retina ready and completely responsive thus giving your visitors an impeccable experience. With this theme you can design the layout from scratch using Visual Composer or use one of the 10 pre-designed homepage styles. With Maxhost you can customize the header, footer, portfolio, blog layout, contact form, and the slider. It also comes with a custom designed WHMCS template. Try Maxhost now! Are you new to this industry and looking to make a great first impression on your audience? If yes, then HostStar should be your choice. HostStar has pretty impressive features such as 4 homepages, several header and footer variations, portfolio layouts, blog styles, contact styles, multilingual support, 40+ custom shortcodes, great documentation, fast support, newsletter, and video tutorials. You can manage this theme completely from your WordPress dashboard without having to code anything. Give HostStar a shot! 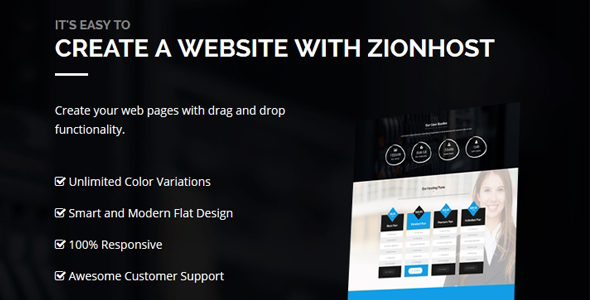 Zionhost is a clean, intuitive, inviting, and visually-pleasing hosting WordPress theme. You can built any page layouts using the included drag and drop page builder and you can also craft custom sliders using Revolution slider – a bonus premium slider plugin. Apart from these two plugins, Zionhost also offers its users WHMCS integration and templates, MailChimp and Aweber integration, 6 homepage styles, blog templates, portfolio variations, and header and footer styles. You have to try one of the best hosting WordPress themes available – Zionhost! 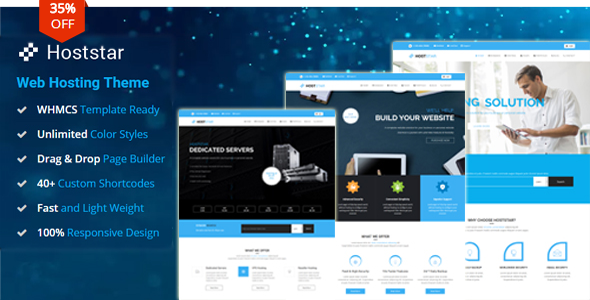 Arka Host is a responsive, modern, easy to use, and innovative hosting WordPress theme. Arka Host comes with a bunch of features that can be found in the advanced theme options panel. Your content will look incredible no matter the device or browser used because Arka Host has a 100% responsive design and is mobile friendly. 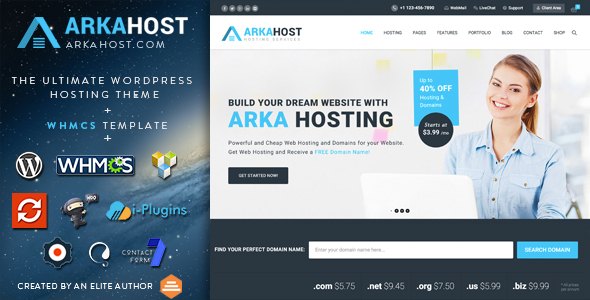 You can easily craft a hosting website with Arka Host thanks to its included hosting demos and WHMCS template. 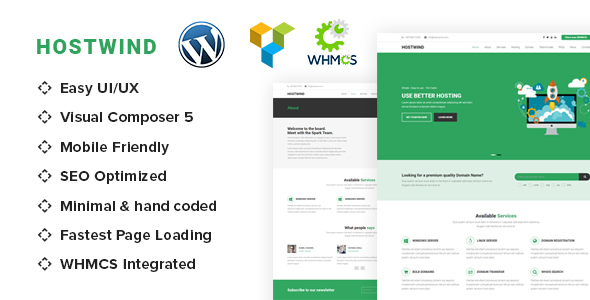 Great hosting WordPress themes will complement your services and products, and will come with features that will simplify your overall workload, and Hostwind is one of them. Hostwind was built with both the webmaster and the visitors in mind. Hostwind has a very intuitive user interface that is mobile friendly, and optimized for speed. The theme also includes Visual Composer, WHMCS, CF7, user targeted, full documentation, live support, demo importer, Google fonts, and over 2000 icons. If you are searching for a theme that will make your life easier than you have to try Hostwind! If you are just launching your hosting services you will find that the market is very competitive and you will need a great theme to keep up. VirtuSky will be an amazing assistant for you and will help you promote your business. This theme comes bundled with Visual Composer and Custom VPS slider which are great for developing layouts and designs. 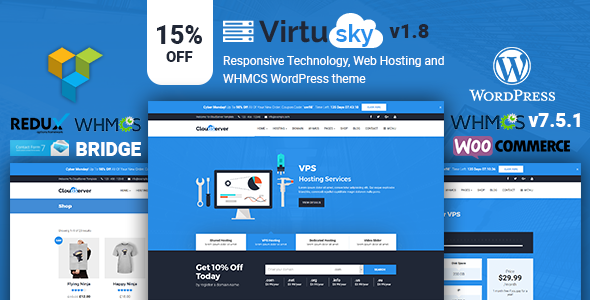 Additionally, VirtuSky is packed with WHMCS bridge plugin, pricing plugin, pricing tables, WooCommerce, sliders, FAQ and testimonials sections, and lots of widgets and colors. VirtuSky is the perfect solution for hosting companies! The most successful hosting companies rely heavily on great marketing in order to lure in new customers and keep the old ones. InHost is a hosting WordPress theme that can help you with that more than you know. InHost lets you take advantage of the 6 demos it comes with so you can have a starting point and then customize them. You can also let your creativity shine and use the integrated page builder and its 40+ shortcodes to develop your own layouts and styles. InHost is fully compatible with WHMPRESS, retina ready, translation ready, SEO optimized, and comes with a domain checker. Let InHost be your savior! Zipprich is a hosting WordPress theme with a modern and appealing design that will be a safe bet for your business. With Zipprich you get 5 homepage variations, Visual Composer, WHMCS, domain checker, header styles, affiliate pages, theme options panel, shortcodes, contact forms, mail chimp, typography options, and Google map. Zipprich will help you stand out from the rest and showcase your services beautifully. Check out what it can truly do! 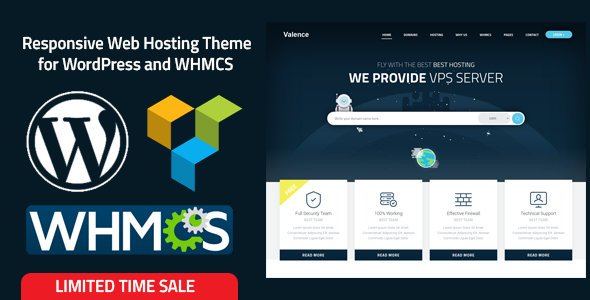 HostWHMCS is a powerful, beautiful, creative, and eye-catching hosting WordPress theme. Each feature integrated in this theme is perfected to present your services to your audience and gently persuade them to purchase. 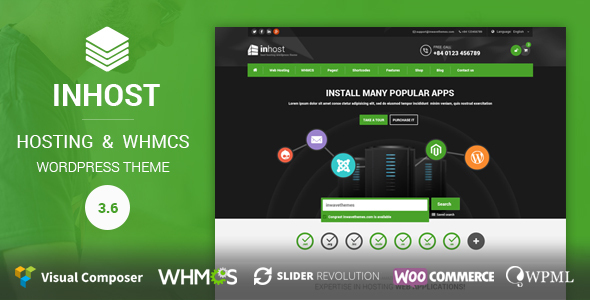 HostWHMCS offers a one click demo import process, potent admin panel, Contact Form 7 integration, video background, unlimited color schemes, custom sliders, custom backgrounds, layout configurator, child theme, sidebars and widgets, and lifetime updates. Even if you have the option to use the demo content, it is more rewarding to build your own website with HostWHMCS! When you are creating a website to market your services you should be looking for a complex theme that allows you to personalize it easily without being too overbearing and tiring. The best hosting WordPress themes will show your audience what you are offering from the get-go in a professional manner so they have time to mull it over. In order to help out, Hosted comes with multiple page layouts, a responsive design, integrated drag and drop page builder, premium slider plugin, live customizer, WHMCS integration, unlimited colors, and Google Analytics. Hosted is more than worthy of your attention! 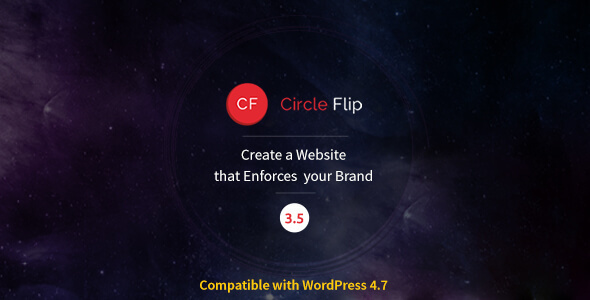 Circle Flip is one of the most powerful and highly customizable hosting WordPress themes on the market. This theme is stylish, fresh, packed with features, and will give your website a responsive new look. Circle Flip offers a variety of fully built demos that you can choose from and use for various niches among which is a hosting demo. This theme is constantly updated, so more demos will be released. Moreover, Circle Flip contains a unique header builder, a page builder, shop page, unlimited sidebars, and Revolution Slider. Consider Circle Flip for your website! Alaska is a stunning, mesmerizing, and original hosting WordPress theme with a design that will enhance your business’ look. To get you started Alaska comes with a complete and extensive documentation, video tutorials, and a support forum where you can ask questions and find solutions. 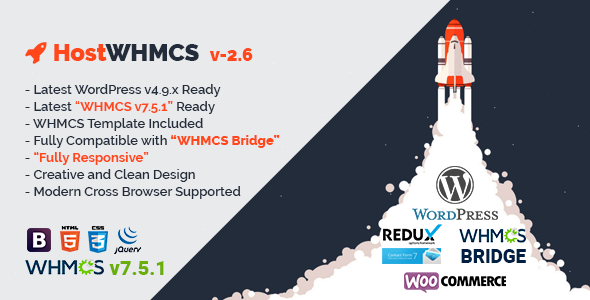 This theme includes the WHMCS bridge plugin along with WHMCS Pro which is an addon of that plugin. Using these you will be able to develop a hosting website in no time. Alaska also includes WPBakery page builder and a premium slider plugin to allow you to develop page layouts. This is one the best hosting WordPress themes in the industry! Spark is a cool hosting WordPress theme with great related functionality and tools. The demo homepages are designed to fit this niche and they are fully responsive and cross-browser compatible. With Spark you also get WHMCS custom dashboard layout that fits with the theme’s design and is highly intuitive and user friendly. All the options and customizations can be found in the theme’s admin panel and there is no need for coding skills or a developer to fully use Spark. Try Spark! 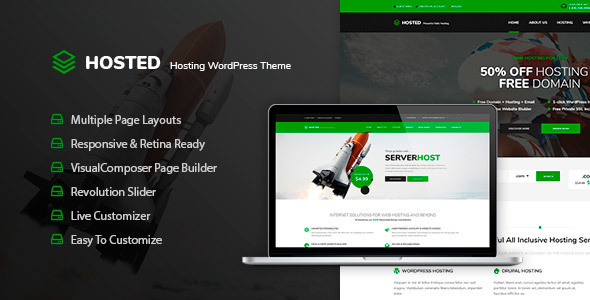 Hostingpress is a lovely, extraordinary, and contemporary hosting WordPress theme that will fit in perfectly with any business that offers hosting services. Hostingpress puts the accent on your services so your visitors will know exactly what advantages they get if they choose you. 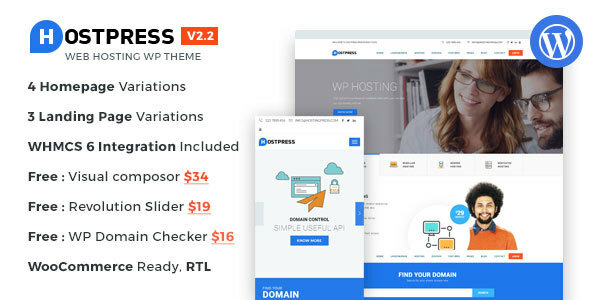 Hostingpress comes bundled with more than 3 homepages pre-made demos, 3 landing pages, WHMCS bridge plugin and a WHMCS template, domain search form, custom hosting icons and graphics, a premium page builder, a premium jQuery slider, and over 25 page templates. This theme will amplify your click-through rate! 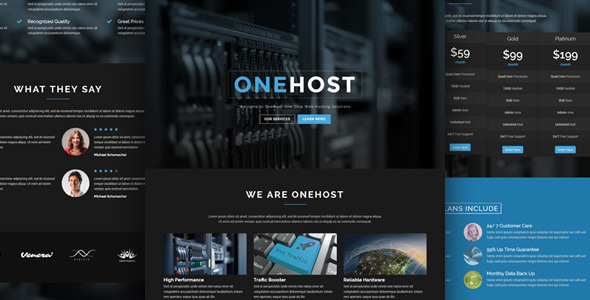 Onehost has a design that totally focuses on the content and keeps the attention on the portfolio and services. Onehost will adapt perfectly to any device and screen resolution because it is mobile friendly. This theme has Visual composer and slider revolution included, along with WHMCS, 10 pre-built homepages, demo data, translation files, unlimited color schemes, and Google analytics. Onehost is easily customizable and you can add your own logo, colors, and create your own page layouts. Climb to the top with Onehost! Multi Hosting is a lightweight, appealing, and joyful hosting WordPress theme. Multi Hosting incorporates a gorgeous design with potent features creating a one of a kind premium theme. 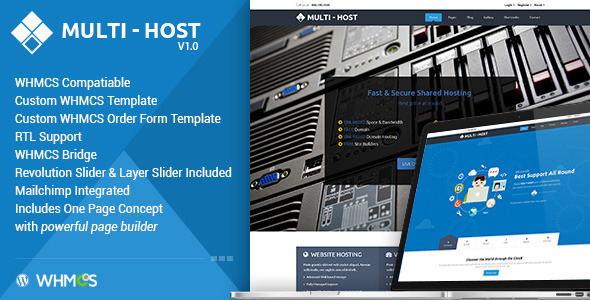 Multi Hosting has a lot of built in tools such as WHMCS templates, RTL support, custom sliders, 4 powerful homepages, and an advanced Buddha panel. Thanks to its WHMCS compatibility you get domain management, integrated support features, automation, billing options, and much more. To learn more about it check out the live preview for one of the best hosting WordPress themes. The services your offer on your hosting website are important, but also just as important is creating an online presence and cultivating a professional image. NRGhost will make that happen for you. With NRGhost you can adopt one of the 3 pre-built homepage demos it comes with and also create your own hosting pages. It also offers a few page templates, a page builder, video tutorials, beautiful shortcodes, smooth parallax effect, and unlimited color options. FlatHost took inspiration from the best hosting WordPress themes in order to create the greatest one. 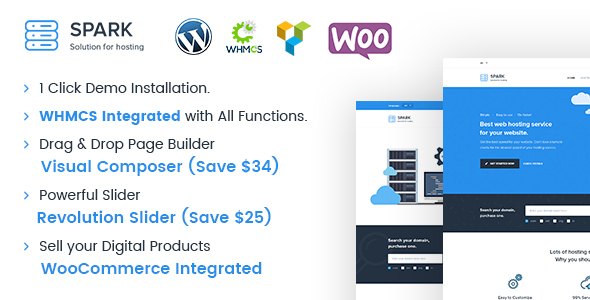 This theme has a bunch of options among which are a drag and drop page builder, WHMCS bridge plugin integration, domain search form, live chat, translation ready, custom widgets, lots of typography options, and a responsive WHMCS template. FlatHost gives you all the necessary tools to craft a professional hosting website in mere minutes! If you are searching for hosting WordPress themes that will stun your audience, then Hostme v2 should be your first choice. Hostme v2 has a bold, ambitious, effective, and flawless design that will engage your visitors and make great first impressions. Hostme v2 incorporates a responsive style, Slider Revolution, 600+ Google fonts, shortcodes generator, PSD files, boxed layout, and unlimited colors. 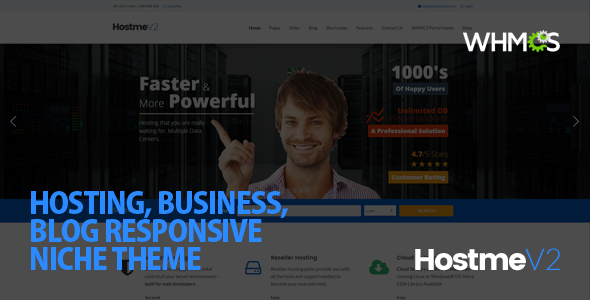 With Hostme v2 anyone can create a high quality website for their business no matter their level of skill. Pick one of the best hosting WordPress themes from the list above and increase your sales. These themes will give you an advantage over your competitors and will help you design a good looking website. For more theme listing and useful articles be sure to subscribe to our newsletter.